So many things to tell you about today, I’ve had to put them in a numbered list! Remember my Blue Sky Alpacas giveaway? Well, we have a winner! Congrats, Naomi, and thanks for liking my blog page on Facebook! (I’ve emailed you for your address and will ship your prize out straightaway.) Thanks to everyone who participated, I loved reading your comments about your favorite travel destinations. Now you have me itching to visit places like the Pacific Northwest, Canada, and The Grand Canyon (I could hit those up in one weekend, right?). Also Norway, France, Italy, Australia… sigh. Too many places to see! Hunter Hammersen has very graciously agreed to review my Sweet Sheep Body Shoppe lotion bars and is hosting a giveaway, as well! 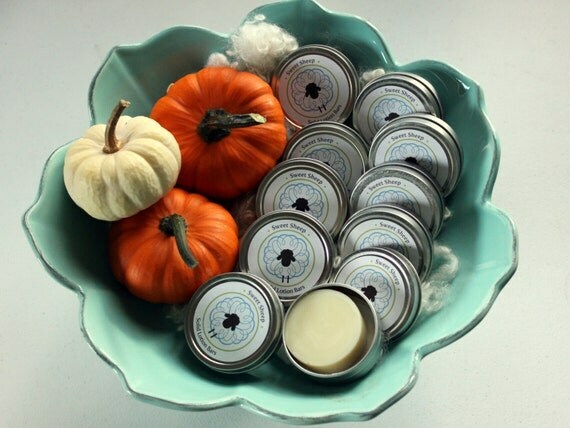 Head on over to Violently Domestic to check out what she thinks and enter to win a lotion bar and lip balm of your choice. Sweet Sheep is proud to be one of this month’s sponsors over at the Knitted Bliss blog! I’ve been a long-time reader of Julie’s blog, and especially enjoy her Pin Up (Pinterest roundups) and Modification Monday series. October means it’s time for the annual October Stockpile event in the Malabrigo Junkies group on Ravelry, which means my Malabrigo-specific patterns (Dissipative & Syrinx Shells) are both on sale for 20% off with the code ‘MalQuick’ through the end of October! Get your quick and colorful cowls on the needles, the holidays approacheth! Have I told you that I’ve added some autumn scents to the shop? I don’t think I have! If you’ve been itching to get your fix of seasonal sensory delights like Pumpkin Spice, Autumn Harvest, and Apple Butter, I can hook you up. And if we ever get a sunny day in New England again, I’ll post photos for new Kumquat, Honey Oatmeal, and Frosted Cranberry scents, too (like my shop on Facebook to be the first to know as soon as new fragrances go up!). This entry was posted in blogland, cowls, designing, Etsy, giveaway, knitting, MyDesigns, sale, SweetSheep and tagged designs, Etsy, knitting, SweetSheep by shoelaceswitcher. Bookmark the permalink. Those fall scents sound amazing! Yay! I’m so excited I won! Thank you so much. I can’t wait for the frosted cranberry to be in your shop…that sounds amazing. Congrats on the Hunter Hammersen review, that is awesome!! I’m glad you are getting some good publicity. I need to get my holiday order into you!